Check out our christmas experiment and decode it with phyphox! Besides releasing a minor update with a bunch of fixes, there has been a lot of great coverage of phyphox over the last week. So, here they are in no particular order (well, I put the English ones at the top). Kit Betts-Masters, a physics teacher from the UK, has covered phyphox on his Youtube channel “Gorilla Physics”, which you can check out here. There was a short but enthusiastic mention in the German podcast bildung-zukunft-technik.de in their “nice apps” category. The widely known German computer magazine has covered us on their webpage in their app category. 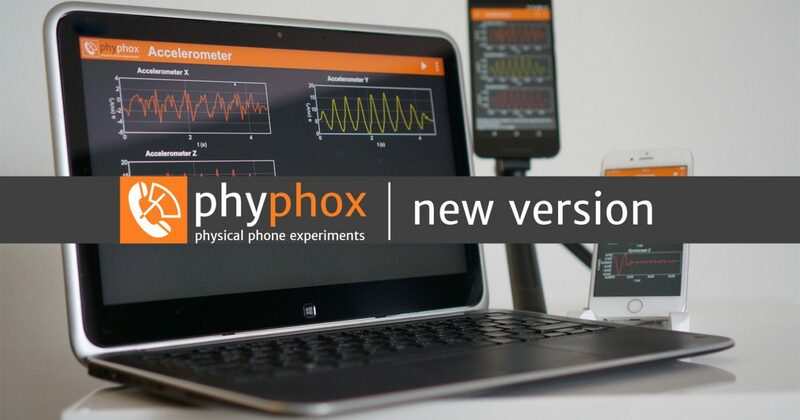 On the 10th of December, iphone-ticker.de featured an article about phyphox on their front-page, which generated an estimate of 10.000 new installs on Apples App Store over the weekend. The German newspaper “Die Zeit” (edition from 15 Dec, p. 38) mentioned phyphox in an article about presents for those enthusiastic about knowledge and technology. At the beginning of the week (12 Dec), we were featured on onemorething.nl from the Netherlands. As I explained in the last update I am mostly working on the next major update and there will only be updates in-between to fix bugs. Well – this is one of those updates. We now use the calibrated magnetometer by default and allow switching to the raw magnetometer from the menu if available on the device. Added an explanation link to the sensor-not-available notification. Acoustic stopwatch now supports multiple timers and allows for setting a minimum delay. Sonar now features a reverse mode where you enter a distance and can determine the speed of sound. Fix: Append-module now accepts value-type input. Fix: Update fails when switching to raw data in remote experiment of the roll experiment (and possibly others). Fix: Some spelling errors in the experiments. Fix: Very short audio loops failed. Fix: Remote access failed when infinite numbers occur. Fix: Crash on Samsung Galaxy S4 when repeatedly playing audio. Fix: Run analysis even when not triggered by a sensor event to allow for self-modifying experiments like a gradually changing tone generator. Fix: Possible crash in average module (race condition mostly triggered on iOS8). Fix: Axis labels were not translated in the remote interface. Fix: Crash in binning module when dx is set to zero. Fix: Handle audio setup changes (plugging in a headset) more gracefully.